Creating the perfect patio space for your pool is important if you want to entertain guests often and make the most of your backyard. You should think long and hard about all of the features that you add to your patio design near Spartanburg, SC. By integrating a dining area, enough seating for everyone, and other small details, you can create a space you will be proud to show off. Here are some tips for you to keep in mind. When designing a patio for their pool, many homeowners will try to work every built-in feature that they can into the mix. From large stone walls to firepits, they sometimes cram too many items into their patio space. Before you do this, consider which features you will actually use and which you can do without. 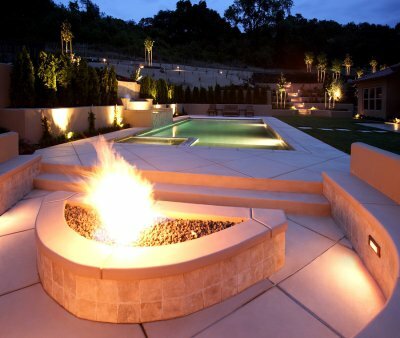 You may get more use out of a portable firepit than you would out of one that is built into your patio. The purpose of your pool patio is to have people over to eat and relax. In order to do this, you will need to provide them with more than enough seating. You can do this by installing a stone wall along to perimeter of your patio that can accommodate a large group of people or you can do it by purchasing numerous chairs and even couches. The last thing you want to do is invite a bunch of people over and then have them sit around in the dark once the sun goes down. A lack of lighting will end your parties quickly and will make it unsafe for anyone to use your backyard pool after dark. You can eliminate this problem by installing lanterns, string lights, and other lighting options around your patio. If you really want to wow people with your patio, you can bring certain pieces of furniture from inside your home outside during special events. You can also incorporate waterproof rugs, cushions, and fabrics into your patio design.